By Mark - Argentina - 09 Nov/02 - Viewed 1862 times. We stayed in Bariloche for five nights - the longest time we have spent in one place so far. We wanted to rest for a bit, and liked Bariloche a lot. The town is situated on the shore of a beautiful lake and surrounded by snow topped mountains. It is very touristy, the main roads consist mainly of chocolate shops and restaurants. There is good hiking in the surrounding National Park. We stayed at Residential Rosan Arko (Guemes 691) for A$12.00 per person. It is small house set apart from the landlady's house in a beautiful garden. There are only three rooms sharing a kitchen and bathroom. The first afternoon we walked round the town and sampled each of the different chocolate shops to see which was the best. Results were inconclusive but we didn't give up. We also felt we deserved a nice meal after the long bus journey so we went to Familia Weiss on Palacios. They do excellent fish (around A$14.00 with potatoes) and pasta (around A$9.00). A bit more expensive than most places but worth it. The third day we hired mountain bikes (A$15.00 per bike per day) to cycle the Circito Chico (60km). However, after a promising start it turned very cold and started to rain. We made it to Cerro Campanaro after 18km which is a small mountain with a chairlift (A$12.00 each) up to a cafe. The 360 degree view from the top is excellent (our landlady assured us this is the best view in Bariloche). In view of the weather, we decided to take a short cut across the middle of Lago Perito Moreno (it�s okay, there is a bridge) instead of all the way round. This saved about 15km. The way back was hard work as it seemed all uphill and the car drivers are obviously not used to cyclists. The following day I walked to the top of Cerro Otto (700m above the lake) which is the nearest peak to the town. Laura decided to stay at the hostel. There is a cable car up, but this costs A$25.00. Also, by walking you get different views all the way along. It took me about two hours to get there (I kept stopping to look at the view) and less than an hour back. There is a revolving restaurant at the top and, bizarrely, a 30ft high replica of Michelangelo's David. Finally it was time to leave for Mendoza, we bought a ticket with Andesmar (A$66.00, 19hrs) and stocked up on chocolate. Lots of up to date information about Bariloche including webcams. 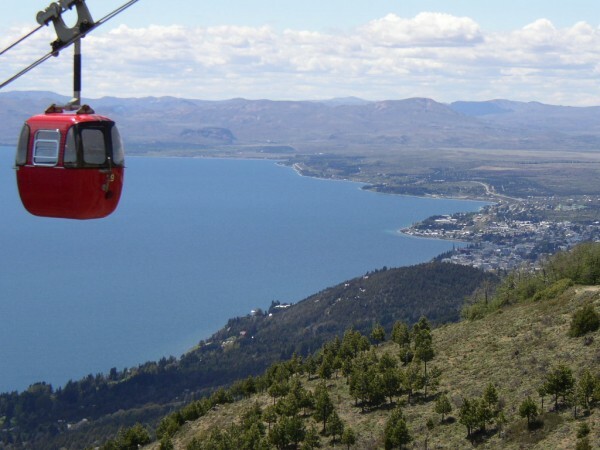 A tour operator offering the lake crossings to Bariloche. Has some nice photos and a map.